Sound "The bass from the Atmos was deep and powerful, and it wasn't mushy or bloated." "The Atmos's low frequencies served the music, reproducing more of it." "A dense, layered presentation that reminded me more of the sound of my Lamm M1.2 Reference amps than that of a phono cartridge. Images were substantial and strongly outlined, while the air around them seemed almost material, so big and three-dimensional was the soundstage." Features Low-output (.24mV) moving-coil cartridge that boasts of a "semi-skeleton" body and cryogenic treatment. "There are three versions of the Atmos, each differentiated from the others by the wire used for their coils. The Atmos S uses five-nines silver wire; the Atmos X (for 'X-ray') uses the 'ideal coil wire,' which is six-nines copper with 'pure crystals' that are 'systematically aligned'; the Atmos G uses gold wire and is understandably the most expensive of the three." Use "There are versions of the cartridge with and without the SB -- silver base -- option. Without this small silver plate on top of the cartridge, the Atmos would weigh a mere 4 grams and be too light on its own for use with many tonearms. (With the silver base, the Atmos weighs 7.9 grams.)" Value "I'm not sure I can name a definitive winner in the battle between these two top-flight cartridges, but I can say I'd love to own both of them, so well does the sound of one differentiate and illuminate the sound of the other. Perhaps the top-of-the-line Zyx UNIverse would halve the difference and surpass them both, though the Atmos makes a very strong case for not spending the extra money." If you find the artisan spirit of high-end audio appealing, where the absolutes inherent in a purely scientific design approach are questioned and even rejected, then you will find phono cartridges especially fascinating. Unconventional ideas and exotic materials abound in the design and manufacture of cartridges, and all of the parts come together on a minuscule scale, so you can't exactly pop off the top and gawk at the handiwork unless you own a microscope. Even people who design and build audio electronics and speakers can only render opinions on phono cartridges. They are a unique part of the audio chain, and building them is a skill that few attempt to understand, let alone come to master. Count Hisayoshi Nakatsuka, chief designer of Zyx phono cartridges and company president, among the masters -- and the artisans. He certainly has an abundance of ideas about phono-cartridge design and performance, and some of them are unique to his cartridges. Primary to his design goals is achieving perfect balance between the two channels, not just in output but also in subjective sound quality, and eliminating what he calls "time distortion." To address these, he has identified "15 vital design points for a MC cartridge," including how the coils are wound, the material from which the body is made, and the grounding of the cartridge. All of these lead to a phono cartridge with what Zyx refers to as a "real stereo" motor system, one that delivers "the real highest-definition sound quality." Mr. Nakatsuka is also an advocate of cryogenic treatment, which accomplishes the "purification" of the metal parts in the magnetic circuit of the Atmos ($4450 USD), the penultimate cartridge in the Zyx range. The cartridge's clear-acrylic body is called a "semi-skeleton," as it is said to have no side panels. It certainly looks like side panels are present. While other cartridge makers choose exotic wood or stone for their cartridge bodies, Mr. Nakatsuka feels that acrylic offers the best sound, and the less of it used the better. There are three versions of the Atmos, each differentiated from the others by the wire used for their coils. The Atmos S uses five-nines silver wire; the Atmos X (for "X-ray") uses the "ideal coil wire," which is six-nines copper with "pure crystals" that are "systematically aligned"; the Atmos G uses gold wire and is understandably the most expensive of the three. In addition, there are versions of the cartridge with and without the SB -- silver base -- option. Without this small silver plate on top of the cartridge, the Atmos would weigh a mere 4 grams and be too light on its own for use with many tonearms. (With the silver base, the Atmos weighs 7.9 grams). According to Mehran of SORAsound, the North American distributor of Zyx products, the Atmos with the silver base "just sounds better" than the version without. I reviewed the Atmos X/SB. All versions have the same micro-ridge stylus, which is rated for 2000 hours of use, and boron cantilever. Zyx makes an extensive line of cartridges ranging in price from $550 for R50 Bloom to $7450 for the UNIverse. Outside North America, the Atmos is actually called the 4D. The two are identical in every way except the name. I mounted the Atmos on an extra armwand for a Graham Phantom B-44 tonearm; here, the SB option was mandatory because the Graham 'arm would not accommodate the cartridge without the silver base. The tonearm was mounted on a TW-Acustic Raven AC turntable (review in the works) -- the single-motor model. Phono stages were an Audio Research PH7 and the optional phono module for the Aurum Acoustics CDP preamp/CD player. An important difference between these two phono stages, at least as they provide gain for low-output moving-coil cartridges like the Atmos, is that the CDP's internal module uses step-up transformers and the PH7 does not. Both provided adequate gain for the .24mV-output Atmos and offered flexibility in terms of loading. Lamm M1.2 Reference and Luxman B-1000f mono amps, along with an Audio Research Reference 110 stereo model, drove Wilson Audio MAXX 2 speakers. Preamps were the aforementioned Aurum Acoustics CDP and an Audio Research Reference 3. Digital sources were an Audio Research Reference CD7 CD player, an Ayre C-5xe universal player, and the Zanden Model 2000P transport and Model 5000S DAC. Of course, the Aurum CDP also plays CDs. Interconnects and speaker cables were from AudioQuest (William E. Low Signature with Sky interconnects mixed in), Shunyata Research (Antares Helix and Orion Helix) and Crystal Cable (Ultra). Power cords were from Shunyata Research (Anaconda Helix and Python Helix in both Alpha and Vx variations) and Essential Sound Products (Essence Reference). Power was provided and cleansed by a Shunyata Hydra V-Ray or ESP Essence Reference power distributor. I used a trio of top-flight tonearm cables: an AudioQuest LeoPard, a Graham IC-70, and a Furutech AG-12. The Furutech cable is the least expensive of the three but by no means the least musically involving. I will have more to say about this well-made, wonderful-sounding tonearm cable in the near future. I didn't find the Atmos particularly difficult to mount or fine-tune, perhaps because I'm not one to change VTA for every record, for instance. I work to get everything sounding its best and then leave it alone, preferring to play LPs instead of playing with my LP-playback rig. Zyx recommends a 2-gram tracking force, and I stuck with that, thinking that the maker would know at what tracking force the cartridge's motor system would be ideally aligned. In terms of loading, I preferred the 200-ohm setting with the ARC PH7 and the 100-ohm with the Aurum CDP's internal phono board. Zyx recommends greater than 100 ohms. One bit of information that's important to potential buyers is how much they'll have to shell out when the cartridge under consideration is in need of a new stylus. Yes, given the musical-chairs nature of being an audiophile these days, chances are that many buyers of new cartridges will move on to something else before they've worn their styluses to a nub. However, for those of us who plan to live with cartridges we've bought until they have to be replaced, the retipping fee is an important, and often sobering, piece of information. The Atmos, like all Zyx cartridges, costs 60% of its list price to retip, so $2670. Why so much? Like most makers of luxe low-output moving-coil cartridges, Zyx doesn't just put a new stylus on an existing cantilever, instead completely rebuilding the cartridge. So while 60% of the list price seems steep, you are also saving 40% of the cost of a new cartridge. Is your damping-fluid trough half full or half empty? I began to draw sonic conclusions about the Atmos, at least about one aspect of its performance, before I played even one note of music. After mounting the cartridge and fiddling with VTF, VTA and the rest of the alphabet soup required to align a cartridge and fine-tune its sound, I pulled out the Hi-Fi News Analogue Test LP [no catalog number] in order to play some test tones that would help me identify the tonearm-cartridge resonance frequency. This should ideally be between 8 and 15Hz -- low enough to be out of the audible range but not so low as to be in the range of the effects of rumble and record warps. While you can determine the resonance frequency based on the cartridge's compliance and the tonearm's effective mass, with the Hi-Fi News LP you can actually see what it is. So there I was playing some test tones to find out the tonearm-cartridge resonance frequency -- 13Hz for the Atmos and Graham Phantom, in case you're interested. On the Hi-Fi News LP the tones begin at 25Hz and move progressively downward. Other cartridges would make the woofers of the Wilson Audio MAXX 2s move at 25Hz, but there would be very little audible output -- just low-level huffing accompanied by woofer movement that let me know some bass frequencies were present. I was understandably surprised, then, when the Atmos reproduced a clear and distinct 25Hz tone, just as though it were being produced by a CD player. "What the heck?," I blurted out, surprised to be hearing anything. I played progressively lower tones, and the Atmos kept up to about 20Hz, after which point it caused the woofers to shimmy and shake as other cartridges had at 25Hz. Still reeling, I pulled out an LP that would put a musical point on this exercise: Steely Dan's Aja [ABC Records AB-1006]. Sure enough, the bass from the Atmos was deep and powerful, and it wasn't mushy or bloated. There was a pistonic throbbing on "Black Cow" that sounded more like digital -- it was that nimble and controlled. I never owned the famous Telarc LP of the 1812 Overture with recorded cannon shots, but if I had, I would have pulled it out to hear it with the Atmos, which constructed a strong foundation for any music I played. The Atmos's low frequencies served the music, reproducing more of it. For instance, with the Music Matters 45rpm version of Horace Parlan's Speakin' My Piece [Blue Note/Music Matters MMBST4043], the rhythm section had presence that I'm convinced the original pressing wouldn't reveal. The bloom of the upright bass and thump of the drums are there, and the Atmos dug them out like no other cartridge I've heard. But all was not rosy during those early hours of use. Yes, the bass was present and well accounted for, but the Atmos sounded rather mechanical overall, lacking in musical flow. Interestingly, though, it literally sounded better with each play, and after about 25 album sides, the clunkiness was replaced by fluidity that let me know the Atmos had arrived. From here on in, it displayed a dense, layered presentation that reminded me more of the sound of my Lamm M1.2 Reference amps than that of a phono cartridge. Images were substantial and strongly outlined, while the air around them seemed almost material, so big and three-dimensional was the soundstage. There was no wispiness to the Atmos's treble, which was realistically paced and concrete, able to capture the metallic sound of a triangle or the blat of brass with force that knifed through the air. High frequencies aren't often described as "palpable," perhaps because they don't often sound like those from the Atmos. I suppose it would be true that the Atmos isn't the last word in terms of air and atmosphere, even given its name, but in high-end audio, as in life, perfection is unattainable. However, no matter how I parsed and analyzed the sound of the Atmos, it bypassed reason. I had to admit that I purely and simply enjoyed what I heard. A good illustration of this came via an album I found at an estate sale: Alexander Brailowsky's Chopin: The 14 Waltzes [Columbia MS 6228]. My interest in classical music is rather narrow, but I love Chopin's music for solo piano, and while I had never heard of Alexander Brailowsky (1896-1976) before buying this recording, I have to say that his playing has the same effect on me as Glenn Gould's. Its idiosyncratic and unmannered, and it seems to be truly an extension of his being. With the Zyx Atmos, Brailowsky's piano spread from speaker to speaker, sounding physical in its lowest reaches and agile throughout. This isn't the best-sounding piano recording I've heard, but the playing is hypnotic -- before I even knew it, the first side was done. While Steely Dan's Aja may point out what the Atmos does well in a more obvious fashion -- the bass power and detail, along with a sharp sense of rhythmic drive -- the Brailowsky recording proves that the Atmos is more multifaceted in its appeal. Perhaps someone can explain Brailowsky's appeal to me, but at this point the more I listen to his playing of Chopin's waltzes, the more I marvel at my good fortune of finding this LP for 50 cents at an estate sale. With each play, it grows on me even more. And this sums up my feelings for the Zyx Atmos as well: The more I listened to it, the more it impressed me, and this feeling trumped any way in which I broke down its sound. Frankly, this is what we should all want from the audio components we buy. 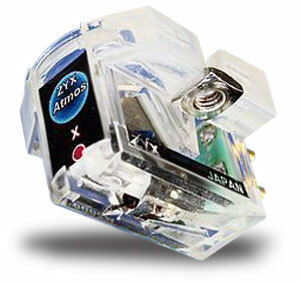 At its price, the Atmos has stiff competition from a number of highly praised low-output moving-coil cartridges, including the Dynavector XV-1s ($4250), which, like the Zyx cartridges, is a product of Japan. The XV-1s is a rather different animal, both in terms of its design and its sound. The XV-1s is over three times as heavy as the naked Atmos, much of this weight coming from the eight alnico magnets it uses. Its body more readily appears to be skeletal, at least to my way of thinking, as much of the cartridge's inner workings are en plen air -- out in the open. The XV-1s is a connoisseur's phono cartridge, presenting the music with great smoothness and directness of expression, not showiness and bombast. Like the Atmos, it grows on listeners, though for very different reasons. Down low, the XV-1s can't equal the Atmos's depth and power -- nor can any phono cartridge I've heard to date. Again, the Atmos's bass is controlled, not overripe or wooly. While I listened to the XV-1s, I never found its low frequencies lacking -- they are as lithe and athletic as the Atmos's -- but there is no question that the Atmos wins easily when it comes to pounding out the rhythmic core of any music I played. It is in other ways that things begin to turn in the XV-1s's favor. When I first listened to this cartridge, I thought that it did little that was noteworthy; however, after living with it, I've discovered that the XV-1s's self-effacing neutrality is what makes it special. The music has an utter naturalness, a caressing way of revealing detail that presents it all without fanfare. In comparison, the Atmos is far more showy; it's hard to ignore the physicality of the music, even as the Atmos presents it in a completely fluid and fluent way. The midrange and treble of the XV-1s are as finely drawn as silk thread, giving it a special way with texture that's always detailed and appealing. The Atmos, in contrast, goes about its business in a different way, sounding big and gutsy -- more about the whole picture than its individual elements. With the Brailowsky recording, the XV-1s seems to focus on the notes, their timing and relationship to each other, while the Atmos conveys the entirety of the performance, conveying more of the piano's grandeur and power. I'm not sure I can name a definitive winner in the battle between these two top-flight cartridges, but I can say I'd love to own both of them, so well does the sound of one differentiate and illuminate the sound of the other. Perhaps the top-of-the-line Zyx UNIverse would halve the difference and surpass them both, though the Atmos makes a very strong case for not spending the extra money. While Mr. Nakatsuka of Zyx may design his phono cartridges with an artisan's sensitivity, the sound of the Atmos certainly owes a debt to some well-applied science. Its audible frequency response was demonstrably wider than that of other cartridges, creating a dense and highly rhythmic presentation that was not lacking in the little things, like musical flow (after proper break-in) and detail retrieval, that can't be measured but can be discerned nonetheless. It reproduced the music in a forceful way, never glossing over the subtleties but also never letting you forget about the power of an orchestra or a piano's lowest registers. No matter what cartridge you're using now, you'll find something to admire about the Zyx Atmos. But don't audition it unless you're able to give it ample time to cast its spell -- and you're ready to write the check.